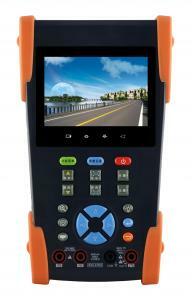 3.5 inch Touch Screen IP camera tester is for maintenance and installation of IP camera and Analogue camera ,display HD camera and analogue camera image ,PTZ control, 4 G SD card, as well as test Wireless IP ,Analog and SDI camera ,12V 2A power output for camera , easy to use and operate . Built in network testing tools (IP address search, PING etc), quickly check the IP camera problem. Cable scan, TDR tester, easy to check the network cable, BNC cable problem, Optical power meter, Visual fault detector function, effective to solve the optical fiber transmission problem. AC/DC Voltage，AC/DC current、Resistance、Capacitance、Data hold、Relative measurement、Continuity testing . Testing speed: 3 times/ seconds，Data range -6600～+6600.